The great libraries of history held a special place in the hearts of scholars because they represented a repository of all knowledge. In the digital age, the single repository makes little sense. Knowledge can be stored and duplicated. As a result, it is protected. What is more, knowledge is at your fingertips. Instead, in 1945, Vannevar Bush envisaged immediate and universal access. [i] His memex, an adjustable microfilm viewer, was to be a store of all knowledge (including personal knowledge) and curated with what we now call hyperlinks to enable searching and associations. The fact that people rarely envisage owned collections rather than shared access should tell us something about how things are supposed to be. Lending is the natural state for books and publishers. So how would the business of publishing look if it were built around lending rather than ownership? To see this, let’s start with the notion that all books are read on devices. Now imagine that each device has a built-in means of tracking what people read and how much. Imagine that it can also do this in a manner that respects privacy. Then it is possible to construct a model that will allow authors or publishers to receive money based on how much of a book people read and to price that at will. How would this work? I imagine that there is a vast exchange available—maybe we could actually call it a library—where all books ever written are available. Publishers nominate reading prices for their books, and consumers read books. One model has the consumers pay the publishers the fees that the publishers quote. This is something akin to what Google would like to see with respect to Google Books. But that isn’t the only model. Alternatively, an exchange might sell access to the library at a subscription fee that doesn’t require consumers to feel the marginal cost of reading another chapter or trying a book. The subscription fees would then comprise revenue, and the authors or publishers would then get paid from that according to their nominated fees and information gathered from consumers on actual reading. This would change the industry in two ways. First, if most people subscribed to this model, then it will also be easy for reading to become a shared good. When you referred others to a book or extracts from a book, there would be no cost to you or them, maximizing the incentives for such sharing and improving the value of reading. Second, part of the reason information wants to be shared is because the costs of creating that information can be spread over more users. While in the past, authors were rewarded on the basis of sales—which partly included nonreading motivations, such as ornamental value—in this alternative model, the contribution to the costs of creation would come solely for reading. This would change significantly the incentives of authors; they would want to create works that were read and, moreover, read the whole way through. [ii] This type of reward structure is simply not possible to imagine in an ownership model. That said, one can see a potential issue regarding giving books as gifts. When there is shared access, this does not seem easily viable; unless, of course, it is a rare, physical copy to be displayed prominently in one’s house. Digital technologies have altered the balance on ownership relative to lending as the principal means by which books, and content similar to books, are consumed. Breaking free of physical norms allows us to think about alternative models that both increase consumer value and also allow the distribution of that value to fund more creative activity. [ii] I should note that not everyone thinks that rewards based on reading would be a good thing. Nicholas Carr, in “Books That Are Never Done Being Written,” Wall Street Journal, December 31, 2011, http://online.wsj.com/article/SB10001424052970203893404577098343417771160.html, for instance, argued that when authors—and worse, commercial publishers—understand what people like to read, they will tailor content toward those likes. Actually, I agree with that prediction. The issue is whether that would be a bad thing. Carr would like books to be immutable so that they can’t be tweaked and we can refer to them. This is a feature of a book I mentioned earlier; it is a point of reference. However, just because technology can allow updating does not mean we lose that point of reference. Instead, we have to ensure that different versions are kept as part of the record, just as they are with Wikipedia today. Transparency is the issue but the requirement to keep books dead set. Amazon’s offering isn’t quite the world library envisaged here (for instance, my books aren’t part of it) but the structure is essentially right. Of course, Amazon weren’t the first to do this but, as with these things, their move is significant. What we don’t quite know is how the author pricing works. Near as I can tell, there is a pool of funds of which the book gets a claim if 10% of their book is read by someone in any given month. It is hard to know what the impact of this will be. Is 10% the right amount? Should there be a scale? I suspect at some point we will start to understand those implications better. For the moment, this is a significant move. If it takes hold, it will be the most significant change to book publishing in decades. By the way, in case you are interested, Piketty’s Capital in the 21st Century, is part of Kindle Unlimited. So if you wanted to read that at some point but know you’ll never really get around to it, then Kindle Unlimited is surely for you. When I moved from printed books (of which I bought thousands) to ebooks, suddenly I owned nothing substantial but at least, I or my heirs and successors, could read any ebook I had purchased for no additional cost (as long as the ebook format remained supported or the vendor would convert/reissue the files. Now they are taking even this away and when I pay my money, I own NOTHING! 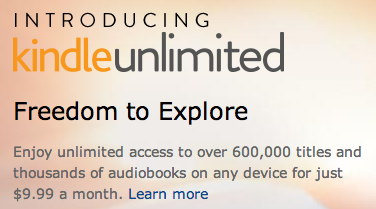 It isn’t clear if Kindleunlimited has similar or other catches. I guess I’ll wait and see. I’m skeptical at best. Isn’t it the case that if you continue to follow the logic of “information wants to be shared” then the model that best serves all people is a virtual public library? In a virtual public library, the subscription fee for reading books would not be paid by individual consumers, but through a universal tax (at least on those earning enough to pay taxes). This would allow anybody, no matter their income, to consume books. I imagine treating books as a public good this way would increase consumption of knowledge and potentially have wide social benefits. But it would also make book publishing as it exists today completely impossible. A universal virtual public library tax would, presumably, increase the pool of money in the book industry. But how would that money be allocated to authors? And what, at this point, is the contribution of publishers? Given the technology of book publishing and distribution that exists today, I have a hard time seeing publishers as much more than rent-seekers doing their best to hold on in a world in which they are obsolete. Who, where, and how might a ‘universal tax’ for libraries be implemented and collected? It hasn’t actually happened yet, anywhere! In the UK, as in the US, real public libraries are tax financed. But in the UK there is also a system of Public Lending Right payments by which authors receive a payment related to the number of times their book is borrowed (obviously there’s no way of knowing whether the borrower actually read it, or gave up after one page). It would be straightforward to extend such a scheme to a virtual library. The key difference between this and Kindle Unlimited is that the virtual library treats reading as a pure public good, to be financed by general taxation: Kindle Unlimited treats it as an excludable private good, financed by a subscription fee. And of course we think of the virtual library as a not-for-profit enterprise, whereas Kindle Unlimited is designed to make monopoly profits for Amazon. My apologies… I was trying to be as general as possible while thinking about the particular case of the U.S. I realize this a very American thing to do. In the U.S. public libraries are financed from local, municipal and sometimes state-level, taxes. A “virtual public library” would obviously be untethered from localities so it requires a non-local tax funding structure. So perhaps a national (or in the U.S. case, federal) tax… but a “virtual public library” really should be accessible to all, not just residents of a particular country. Hence, my reference to a “universal” tax (again, on those who can actually afford taxes). Obviously, this isn’t realistic. It wasn’t meant to be. My point is that if you follow, and agree with, the logic of the statement that “information wants to be free”, then you should logically end up wanting a free, universal, virtual public library and that it would likely be funded through taxation. Long story short, if you agree that information is a public good and want to maximize the social benefits of information consumption, you should in principle be for a free virtual public library. And that position is incompatible with book publishing (among other things) as they exist today. “Information” encompasses only a little of what comprises a book. When information is processed, structured, and analyzed, it becomes “knowledge” and even that still does not encompass the whole of what is found in books. A great deal of what is found in writing/books is neither information nor knowledge. One might claim that a photograph is nothing but information. However, the photographer has chosen, intentionally or otherwise, to include and exclude much of what was visible to the eye. The photographer chooses (or lets the camera choose) aperture and speed which define the depth of field. This constitutes the artistic component of the photograph. Which is why while nature cannot be copyrighted, a photograph can be. All writing necessarily contains this artistic element which may be the most important element. My point is that “information” may want to be free, but it’s a huge leap from that to arguing books should be free. So far in your discussion, you have completely failed to bridge that gap. “[my argument]” follows if one agrees with the premise that “information wants to be free.” I did that because I got the impression that Josh was, at least to some extent, writing the post above with that premise in mind. But I agree with you that there are many nuances here and I certainly can’t resolve all issues pertaining to the nature of information and/or knowledge as a public good (and certainly not here). I enjoyed discussion – thank you very much. Previous PostPrevious Do patents stifle cumulative innovation?